Plan to Work serves the counties north of the Oregon-Washington border (in green). 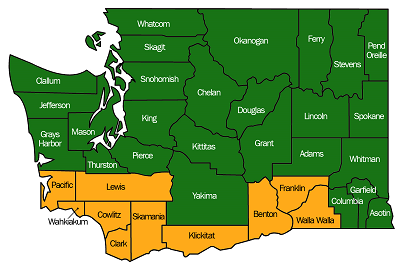 Our partners at Disability Rights Oregon and Plan for Work serve the counties along the Columbia River (the counties of Pacific, Lewis, Wahkiakum, Cowlitz, Clark, Skamania, Klickitat, Benton, Franklin, and Walla Walla, shown in yellow). Services are free and confidential.